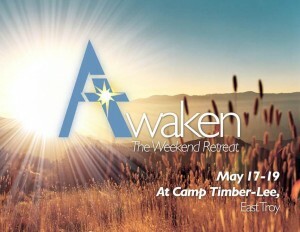 Next weekend I’ll be speaking at the Awaken Weekend Retreat, and I’m really getting excited! I’ve been praying and preparing for it for several months now. The purpose of an Awaken retreat is to come away from our everyday lives for a few days in order to intently seek God for direction, breakthrough, freedom, growth, etc. It’s an amazing ministry and I’m so honored to be a part of it this year. The leadership team has been praying for everyone attending the retreat for months, and especially in the 40 days leading up to this retreat. We’ve been praying for you even before you knew you were coming! There are still a few spots available for the retreat, which is open to men and women. If you’re interested in this retreat, if you would like to make time to spend the weekend with the Lord, I encourage you to make the call today to be a part of it. Next Saturday, March 16, I’ll be teaching the breakout session Reigniting Your Hope at the “Revive” one-day Women’s Conference at Oak Creek Assembly of God. I’m excited to share my story with other women and encourage them to seek out their Hope again. Hope is so very hard to see when you’re in the depths of despair or excruciating circumstances. I’m also very excited to be able to hear the keynote message from Pastor Laurie Ganiere. She’s a wonderful encourager and teacher. If you would like to attend the conference you can find more information on the facebook event page or call the church office to purchase tickets at (414) 762-2010. Tickets are $16 ea. I’m giddy this morning, because I have a guest post over at KaysePratt.com! Kayse was one of the first bloggers I recognized in person when I trekked to Charlotte, NC this past summer for a speakers & writers conference. I had become acquainted with her through her blog and through our facebook networking group, so spotting her (in the bathroom!) was kind of a celebrity moment. I don’t even think I introduced myself, because at the time I figured rushing a girl in the bathroom and telling her how much I enjoy her blog would be tré weird. Kayse and I have both lost our moms to cancer-that’s what stuck out to me when I first read Kayse’s blog. I rarely have an opportunity to bond with anybody in this respect, and I had never read about such a thing on anyone’s blog and seen it put out there like that. So, needless to say, I was immediately interested in everything else Kayse had to say. She’s as real as she can be for her readers, and I can’t get enough of that kind of approach. I had liked my Stepmom when we first met her, when she and my Dad were just friends, but once she and Dad developed their relationship she and I were at odds with each other. My poor Dad, he was stuck in the middle two women he loved and felt compelled to protect! She and I would bicker, and at times it was very un-pretty. I was convinced that she was the problem. After all, what kind of woman would try to come between and a father and daughter that had such a close bond? You can read the rest here. And if you’re feeling a little un-excited about dealing with problem relatives over Christmas, consider leaving a prayer request in the comments on the full post. I promise to pray for your family relationships over the Christmas holiday, and I’m thankful for each and every one of you. I believe that sin is real and rampant. I believe there is an enemy of God and His people. One that prowls around like a roaring lion, seeking someone to devour (1 Pet 5:8). A trickster, who disguises himself as an angel of light (2 Cor 11:14), but who is truly a murderer and a liar (John 8:44). I believe that his temptations can and do overcome even the most faithful servants of God, even beloved King David. I worship a God that rebuilds ruined places and plants that which is desolate (Ez 36:36), whose strength is made perfect when we are weak (2 Cor 12:9), who can restore His people and make them strong, firm and steadfast following suffering (1 Peter 5:10). I worship a God that can restore what the locusts have eaten (Joel 2). When you are hurting, He is with you. He sees. He cares. He has peace and healing for you. You cannot do it on your own, but He can. But maybe that isn’t quite enough to comfort you, maybe it makes you feel vulnerable and helpless because it’s out of your control. Here is what you can do: “Rejoice in hope, be patient in tribulation, be constant in prayer” (Rom 12:12). “Cast your burden on the Lord, and He will sustain you” (Ps 55:22). Know that “Weeping may endure for a night but joy comes in the morning” (Ps 30:5). In my teens and early twenties I fought bulimia and binge eating, it was confusing for me. I had a sporadic history of both problems instead of a continuous long-running battle. I could be fine for a year and a half and then be crippled for eight months wherever food was concerned. Eventually I came to realize that my eating disorder was really just a symptom. There was a deeper, underlying cause…. I’m honored to have the opportunity to share my story on the One Degree Ministries’ blog today. I haven’t written publicly about this struggle yet, I’m excited to see what the Lord will do with my story and experiences in this regard. As with every victory over struggle, once I’ve moved past the struggle and have become stronger I marvel at the Lord’s grace and favor. That He would care enough to bless me in this area, that He even cares about the food I put in my mouth and the issues of my heart, humbles me and I know that it is only by His strength that I stand on the other side of this struggle.